There are so many reasons to own this 4-string, short scale hollowbody Hofner Ignition Club electric bass guitar. Are you needing a bass to capture that elusive old-school thump?. Maybe you want the sound of an upright bass, but don't have the room on the gig for one. In 1956, Walter Hofner had an idea for an amplified semi-acoustic bass. When it was brought to life, his idea resulted in a bass with a warm, woody, double-bass-like amplified tone. Many players revere Hofner basses for their historical significance as well as for their smooth, sweet sound and playing ease that eludes most ordinary basses. This bass has been lightly modified: the pickguard has been removed (screws remain), and has been restrung with La Bella 750T White Nylon Tapewound strings. Get your hands on this Limited Edition Hofner Ignition Club LTD bass in '70s Green. It features an ultra-light-weight hollow-body construction, slim 30-in. maple neck with rosewood fretboard, spruce top and spruce back and sides. There are so many reasons to own this four-string, short scale, hollowbody Hofner Ignition Club electric bass guitar. Are you needing a bass to capture that elusive old-school thump?. Maybe you want the sound of an upright bass, but don't have the room on the gig for one. New style hard shell Hofner Case. Case only, bass is not included. case that is a huge. HOFNER HCT 500/2 CLUB BASS GUITAR. Sunburst finish. The semi-hollow body and set neck will give you the warm, round tone you expect from the club bass. Nickel plated hardware. laminate Maple Body (like the originals). Hofner Ignition Club Bass. Includes one set of Hofner Round Wound Strings. Fully hollow body. Trans Black Finish. Lightweight and with its short scale (30") neck it is a pleasure to play, even for hours without getting back-ache and fatigue. Hofner Ignition Club Bass. Includes one set of Hofner Round Wound Strings. Sunburst Finish. Fully hollow body. Lightweight and with its short scale (30") neck it is a pleasure to play, even for hours without getting back-ache and fatigue. Hofner Ignition Club Bass. One set of Hofner Roundwound strings are included. New style hard shell Hofner Case is. The truss rod is adjusted to proper tension, string height. Lightweight and with its short scale (30") neck it is a pleasure to play, even for hours without getting back-ache and fatigue. Hofner Ignition Club Bass. One set of Hofner Roundwound strings are included. New style hard shell Hofner Case is. The truss rod is adjusted to proper tension, string height. Sunburst Finish. Lightweight and with its short scale (30") neck it is a pleasure to play, even for hours without getting back-ache and fatigue. Hofner CT Club Bass - Sunburst Finish Contemporary Electric Bass, New! Hofner CT Club Bass - Sunburst Finish. The center block improves sustain. Contemporary Series Electric Bass Guitar. Currently, we are now located right outside of Center City Philadelphia in Pennsauken, New Jersey. It's an affordable way to get the Hofner look and style that players have enjoyed for years. New Gear: If you’re not satisfied, neither are we. It’s that simple. Check-Out Now! Light in weight and easy to play with the 30" short scale neck. Bridge Pickup: Hofner Staple Nickel. Neck Pickup: Hofner Staple Nickel. Finish/Color: Sunburst. - Overall polish of body and neck. - Check action and adjust if necessary. Classic Hofner tone for bassists on a budget! Sunburst Finish. 42mm Nut Width. 30" Scale Length. A few faint finish scratches near the neck joint. They are in the finish only and are. This is for your protection as well as ours! (ID: I-28054 ) AB-DYRR. Sheet Music. BOUND NECK AND BODY. 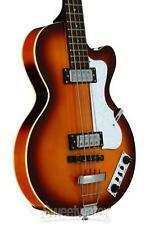 Hofner Club Bass, double cutaway (DC). Made in Germany. Mint condition. Played less than an hour. Case has tiny nick and small white spot. Flatwound strings. Factory label still on hard case. With certificate and other case candy. Hofner CT Club Bass - Sunburst Finish Electric Bass Guitar with Case, New! Hofner CT Club Bass with Case - Sunburst Finish. Includes Hofner CGC-CB Hardshell Case. Contemporary Series Electric Bass Guitar with Case. The center block improves sustain. Currently, we are now located right outside of Center City Philadelphia in Pennsauken, New Jersey. Pickup Neck:Hofner Staple Nickel. Pickup Bridge:Hofner Staple Nickel. Nut Width:42mm. Wood Top:Spruce. Nut Width:42mm. I will try my best to resolve the issue. From Hiroshima, Far east island Japan! FREE Trial! This is a Receiving orders. I can answer ASAP! If you need ASAP! Nut Width:42mm. Neck Wood:Maple/Beech/Maple. Scale:30"/76cm. Japanese products, I can help you! From Hiroshima, Far east island Japan! If you need ASAP!